MacDailyNews Take: How many customers are still waiting for iPhone 6 Plus. That is the great unknown. The current ratio of iPhone 6 to iPhone 6 Plus sales could be more of a supply issue than a demand issue. 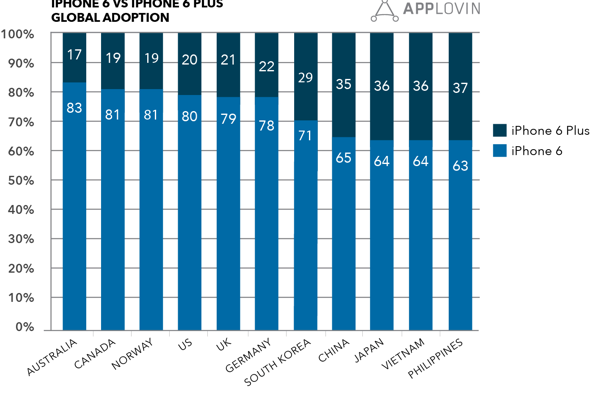 iPhone Plus supply continues to be severely constrained compared to iPhone 6. When supplies are more adequate (it’ll take months), we’ll be able to get a better gauge of iPhone 6 vs. iPhone 6 Plus popularity. I can’t get a 6 Plus with more than 16GB’s here in Australia. Argh. Still waiting. I would suggest that if everyone who wanted one had a 6 Plus then the stats would be different. A co-worker of mine has an iPhone 6 Plus, and he f***ing loves it. I thought it was cool, but it was a little big for my tastes, so I went with the 6. It’s a big hit everywhere except within Bill Gate’s Reality Distortion Field! I have heard, some carrier’s, orders originating on launch day or pre launch are still not fulfilled. I ordered directly from store.apple.com on my iPhone!!! It was just one tool in my iPhone pre order war chest. As we will remember, Apple’s own website was down for quite some time. I believe this added incentive to purchase directly from the main carriers, where they ended up selling more units than anticipated. While scalpers purchased phones on launch day and shipped them all over the world, quite a few upstanding customers are left waiting. I ordered my 6+ from AT&T on September 18th. I received a notice that it would ship between November 5 and 15. On the 14th I received a notice that the order had been cancelled. No valid reason. Just cancelled. I then made two visits to the AT&T store (the first two involving lengthy calls to AT&T), I made a lengthy call to AT&T on my own, and I made a third trip to the AT&T store. Long and short: Too bad. I had to reorder from scratch, blowing off the month long wait I had gone through. Word is it will now ship the week before Christmas (which means it arrives in January of next year). As for the refund on the sales tax I paid for the first order? They have no record of it and nothing was refunded on my card. I really hate AT&T. It’s too bad that it is the best carrier for my 400 mile flight path. If they mysteriously cancel this order as well, I’ll go ballistic. Don’t you have your original receipts or transaction conformation number? Always long waiting lists in AT&T store, seeing people sitting around and waiting to be served.. Frustrated!. I compared the 6 to the 6+ when I was at an Apple Store in Tokyo a couple of weeks ago. While I really like the 6, the 6+ was much more aligned with my wants for a smart phone. I ordered my 6 Plus 64GB from Apple on October 31 since the nearest Apple Store and Verizon didn’t have squat. Got the ship notice yesterday but it won’t arrive until December 1. Two fellow workers have the 6 and they are sweet. Replacing my iPhone 4 with a 6 Plus will be one heck of a big change and I can’t wait. Still adjusting to the large size of the 6. I’m glad I don’t have to buy a 6+. Ordered my 6+ today with a delivery date of JANUARY 1, 2015! OUCH!